1. Individual Membership – $35 per year, $100 for three (3) years. Billy Goat Society memberships available here. Complete Individual membership to join now. If you are a current RMGA member please click here to purchase your Billy Goat Society Membership. Discounted membership options with Wild Sheep Foundation (WSF) – Receive an exclusive code to use for a discount when joining the Wild Sheep Foundation. Discounted RMGA branded apparel – RMGA members receive a discount code to use in the RMGA Store. 2. Become a “LIFETIME” Member – $500. Billy Goat Society memberships available here. Complete Lifetime membership to join now. If you are a current RMGA Lifetime-Member please click here to purchase your Billy Goat Society Membership. You will be issued a permanent LIFETIME member number. Membership numbers start with #1, #2, #3 and are assigned in numerical order based on the date and time that you join. The next available number is indicated on the Lifetime Member List page. RMGA Lifetime members are listed on our Lifetime member page, unless the member chooses to remain anonymous. Visit the LIFETIME Member List page to see the list of our lifetime members. 3. Sponsoring “Business” Membership – $250 per year. Listing with logo and link to your website on RMGA’s “Supporting Sponsors” webpage. RMGA will promote any exclusive special or discount that you wish to offer RMGA members. 4. Base Camp Sponsor – $500 per year. 5. Alpine Sponsor – $1,000 per year. 6. Summit Sponsor – $2,500 per year. 7. Title Sponsor – $10,000 per year. Please consider making an additional donation to our Conservation Fund and/or our Education Fund. The Rocky Mountain Goat Alliance is an approved 501(C)(3) non-profit corporation registered in the state of Florida with headquarters in Bozeman, MT. 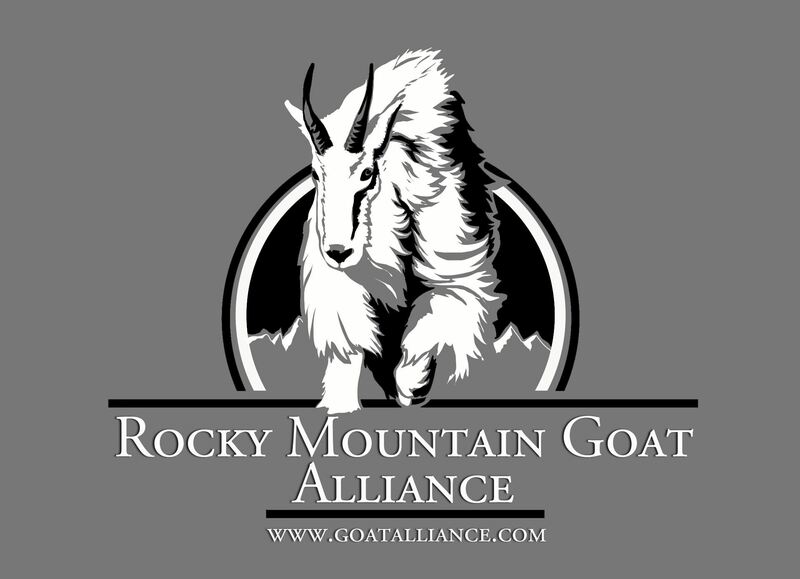 Buying t-shirts, hoodies, decals and other RMGA branded merchandise is a great way to support and promote the Rocky Mountain Goat Alliance.